METS is the Metadata Encoding and Transmission Standard, which is applied to encoding metadata via a standardized XML schema. METS handles all types of metadata that is relevant to preservation: descriptive, administrative, and technical/structural metadata are all included in the schema, and a METS document will serve as the container for all of this information about a digital object. The schema was initially developed for the digital library community, and has thus extended to the digital repository and preservation communities. The fact that METS confines varying types of an object’s metadata to one standard XML-based file type is excellent news for sharing and preserving resources. 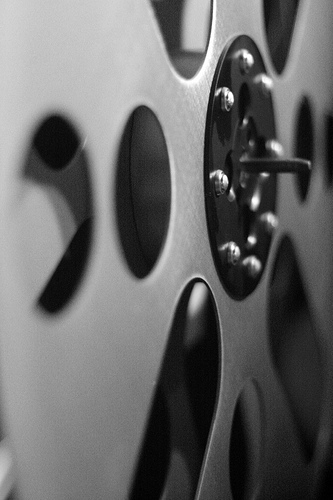 As is evident through the experience of many current digital preservation programs, collaboration among multiple institutions is a very strategic move for a successful digital preservation program. Using METS as a guideline for creating readable and transferable metadata ensures a more seamless sharing experience. It also aids in escape strategies should the repository or institution hosting the repository fails and the digital objects need to be transferred to someone else’s care. The beginnings of a standardized metadata scheme for collections of digital objects can be traced back to 1997, when UC Berkeley and the Digital Library Federation (DLF) initiated a project to further the concept of digital libraries sharing resources. By 2001, the DLF-sponsored METS schema emerged, which is supported by the Library of Congress, and was made a NISO standard in 2004, and was renewed in 2006. 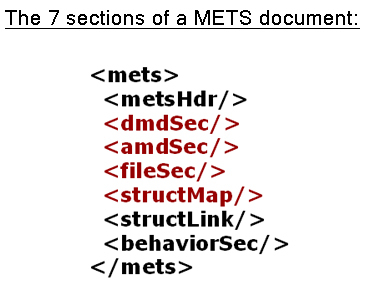 It is important to realize, however, that according to the METS standard, the only required part of a METS document is the Structural Map. So in order for METS to be effective when applied to preservation, there must be information in each of these sections (FYI – a truly complete METS file will also include a header <metsHdr>). So where do we get this information to fill up a METS file? The answer is PREMIS. You may recall that PREMIS is also an XML schema that has been developed for preservation metadata. The PREMIS structure is based on entities and semantic units that will harbor information about a digital object that is necessary for supporting and recording digital preservation actions. What’s important here is that PREMIS will sit inside the METS document. You can see an example of this here. All of the preservation information will be present in the PREMIS file, and by nesting the PREMIS data into the METS file, the metadata becomes transferable to other repositories. The flexibility of both of these schemas implies that there are variations and complications with integrating PREMIS and METS. The Library of Congress created a working draft of guidelines for this process, which is viewable here (PDF, 25K). METS Primer (Revised 4/2010) (PDF, 1.53MB) – Readable, and has color images and examples. PREMIS in METS toolbox, information about the project here. McDonough, J. (2006). METS: Standardized Encoding for Digital Library Objects. International Journal on Digital Libraries, (6)2, 148-158.